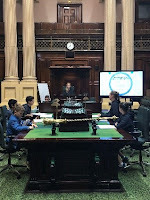 As part of the Year 5 Inquiry Unit in Term 4, our classes recently visited Parliament House and the Old Melbourne Gaol. The children took part in tours conducted by experienced tour guides. Last week, all Year 5 classes visited the VSSECat Strathmore Secondary College to take part in ‘An Expedition to MARS’ and a ‘Tickle my Droid’ programming session. Two workshops simulated a research station on the planet Mars and Mission Control. The students were fitted out with flight suits on arrival. As astronauts they completed hands-on science experiments and communicated their results to Mission Control using sophisticated computer technology. Excitement was heightened when a mission-ending problem arose! Students also participated in sessions covering programming and coding, learning to control SPHERO SPKR robots on Mars. The students and staff thoroughly enjoyed their visit to the Victorian Space Science Education Centre. We would like to thank the parents who accompanied the groups. Without their contribution, excursions such as these, would not be possible. Year 5 Team. This term, as part of our Natural Disasters Inquiry Unit, Year 5 visited IMAXto watch a short film, ‘Forces of Nature.’ The film showcases the awesome spectacle of earthquakes, volcanoes and severe storms. It follows scientists on their quest to understand the origins of natural disasters and the impact they have on humans. With the aid of the giant IMAX screen, the students witnessed the violence of the natural disasters and their devastating effect on our world. This film links closely to the Dynamic Earth exhibition at Melbourne Museum, which includes a 3D volcanic eruption experience, fascinating examples of igneous rock and the minerals found within, combined with The Forest Gallery, where the groups strolled through a bushfire exhibit. Personal trainers from the local ‘Vision Gym’ came to Gardenvale PS this term to as part of the Yr 5 program. David Wescon, the Director of Vision Personal Fitness, and three trainers, Dan, James and Jacob conducted a program of competitive ball games and fitness skills over a two week period. All equipment was provided by Vision. The clinics were a great way to teach the different components of fitness and to teach the children the importance of keeping fit. A most enjoyable and productive program for all involved! 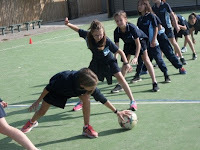 Coaches from Cricket Victoria came to Gardenvale PS this term to conduct a series of clinics for the Year 5 students. 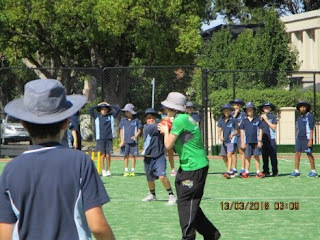 Emma Gallagher, the Development Officer for Cricket Victoria brought state players, both male and female to Gardenvale PS to coach our students in batting, fielding and bowling skills. All equipment was provided by Cricket Vic. The clinics were a great way to teach skill development and the T20 game. A most enjoyable and productive program for all involved! Congratulations to the 80+ Year 5 students on the successful completion of their Bike Education Week. The program involves a mix of practical activities conducted off-road (in the school grounds) and on-road (on local roads) together with classroom activities. Bike Ed inspires children to develop their bicycle riding skills and their physical capability. Other benefits include enhanced health, fitness and wellbeing, confidence and independence and learning and social development. The final activity for the week is a ride from school to Gasworks Arts Park, Albert Park. A total of 24kms there and back through local streets and along the coastal bike path to a barbeque lunch. The children under the guidance of their teachers and parents put into practise their newly acquired knowledge of the ‘road traffic environment’. They negotiate traffic light crossings, roundabouts and busy intersections. No mean feat for a group of over 90 kids! !